Chuchotage, or whispered interpretation, is a mode that falls under the category of simultaneous interpretation. It is a form of simultaneous interpretation, that is done in a low voice, directly into the recipient’s ear. 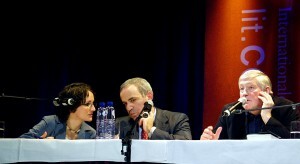 For this type of interpretation, the interpreter sits next to, or slightly behind, the recipient whilst whispering an interpretation of the original speech. This mode is usually only used when the use of technology is not possible due to the situation in which the interpretation is being conducted or in cases where there are only one or two recipients. The interpreter is often forced to sit in an uncomfortable non-ergonomic position (leaning toward the recipient). They may also have difficulty concentrating in unfavorable or noisy conditions where there are distractions and people talking at the same time, while they try to adapt their posture and the tone of their voice so that they don’t bother the recipient or the other people around them that don’t need an interpretation.